Courtesy of FORCE BLUE TEAM. "FORCE BLUE is a unique program that trains military veterans on coral restoration underwater projects," explains Bruckner Chase. "They are doing their first deployment later this month in Grand Cayman." The idea for FORCE BLUE grew out of a dive trip that co-founders Jim Ritterhoff and Rudy Reyes took with Keith Sahm in the Cayman Islands in 2015. Sahm, General Manager of Sunset House, the oldest continuously operated dive resort in the Caribbean Sea, showed Reyes the beauty of the coral reefs. Reyes was a former military veteran who struggled with depression since returning home from multiple tours in Iraq and Afghanistan. The experience changed his life and his perspective of the marine environment that had previously served as his professional venue. “This trained combat diver is one of the best, most highly skilled individuals you’ll ever encounter underwater. Yet he’s never seen a fish,” Ritterhoff remembers about Reyes who dove not for enjoyment or research, but as a cover or location for a military operation. The experience in the Cayman Islands ultimately led to the establishment of FORCE BLUE. 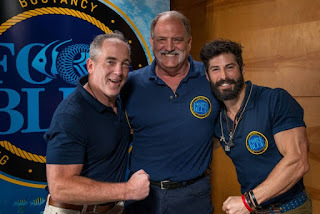 Ritterhoff, Reyes and Sahm decided that they could replicate Reyes' transformative experience and include other combat divers from all branches of the U.S. military service and bring them together with marine scientists, coral reef conservationists, journalists, and celebrities. For more information, visit FORCE BLUE here. Photo above shows Ritterhoff, Sahm and Reyes.